Certified Locksmith in McAllen Texas. Consider Us to Install & Repair Panic Bars/Push Bars Today! A trusted 24/7 locksmith provider for McAllen Texas and surrounding areas. Welcome to McAllen’s most certified locksmith business! With locksmith certifications from several of the top certification programs in the world you can feel rest assured knowing that when you call to hire our certified locksmith services that you have made the best decision. Hire our certified locksmith services and have peace of mind! 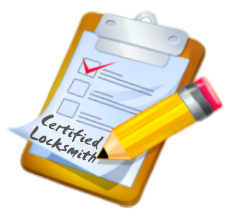 We keep our locksmith certifications up to date. Every month (as part of their requirement to work for our company) the locksmith technicians that we employ participate in at least one locksmith certification and training program. From the automotive industry, home security, to commercial locking systems, we stay up to date and are on the cutting edge of the locksmith industry in McAllen. You wanted the best and you found us! We take great pride in being the absolute best at what we do. Why? Because professional locksmithing is our passion. We love what we do and it shows in our enthusiasm for this trade. Convenient scheduling to meet the needs of the busiest professionals. Our certified locksmith services are flexible to meet your schedule. Anytime before work, after work, or on the weekends we can help you. Call now to hire us (956)508-8090. We offer a 10% discount for Military, Seniors, Students, and Victims of crime. You can also get a discount by filling out our online request service form HERE. Certified Locksmith https://locksmithmcallen.com/certified-locksmith/ 4.2/5 based upon 13 reviews. All the ways that a good lock can protect you. McAllen Locksmith Pros is a highly recommended locksmith company in McAllen Texas and surrounding areas. We have a high reputation in the industry and among our customers. Our company is licensed, bonded and insured, and we provide outstanding services. Our locksmith in McAllen experts are highly knowledgeable and are dedicated to ensuring complete customer satisfaction. Give us a call today and speak to our experienced customer service agent.